This example shows how to use the functions GlobalSearch and MultiStart. 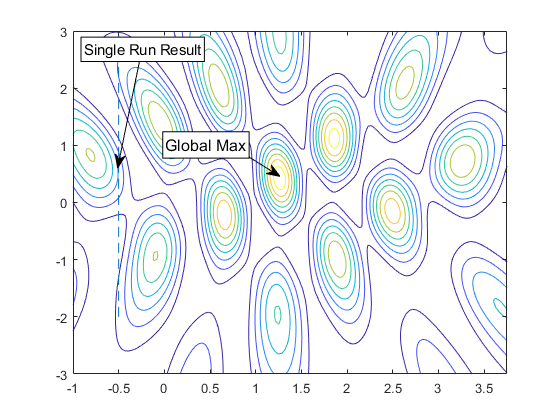 This example shows how Global Optimization Toolbox functions, particularly GlobalSearch and MultiStart, can help locate the maximum of an electromagnetic interference pattern. For simplicity of modeling, the pattern arises from monochromatic polarized light spreading out from point sources. where is the phase at time zero for source , is the speed of light, is the frequency of the light, is the amplitude of source , and is the distance from source to . For a fixed point the intensity of the light is the time average of the square of the net electric field. The net electric field is sum of the electric fields due to all sources. The time average depends only on the sizes and relative phases of the electric fields at . To calculate the net electric field, add up the individual contributions using the phasor method. For phasors, each source contributes a vector. The length of the vector is the amplitude divided by distance from the source, and the angle of the vector, is the phase at the point. For this example, we define three point sources with the same frequency ( ) and amplitude ( ), but varied initial phase ( ). We arrange these sources on a fixed plane. Now let's visualize a slice of the interference pattern on the plane z = 0. As you can see from the plot below, there are many peaks and valleys indicating constructive and destructive interference. We are interested in the location where this wave intensity reaches its highest peak. The wave intensity ( ) falls off as we move away from the source proportional to . Therefore, let's restrict the space of viable solutions by adding constraints to the problem. If we limit the exposure of the sources with an aperture, then we can expect the maximum to lie in the intersection of the projection of the apertures onto our observation plane. We model the effect of an aperture by restricting the search to a circular region centered at each source. We also restrict the solution space by adding bounds to the problem. Although these bounds may be redundant (given the nonlinear constraints), they are useful since they restrict the range in which start points are generated (see the documentation for more information). where and are the coordinates and aperture radius of the point source, respectively. Each source is given an aperture with radius 3. The given bounds encompass the feasible region. 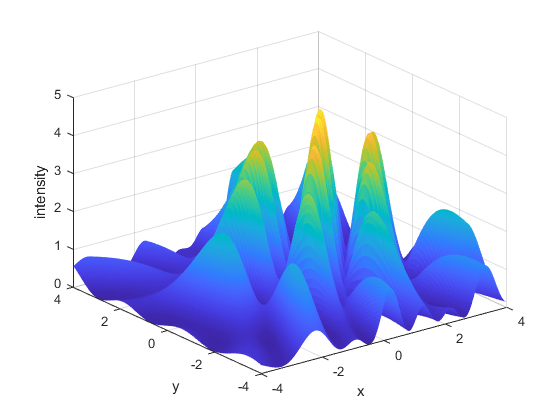 The objective ( ) and nonlinear constraint functions are defined in separate MATLAB® files, waveIntensity.m and apertureConstraint.m, respectively, which are listed at the end of this example. 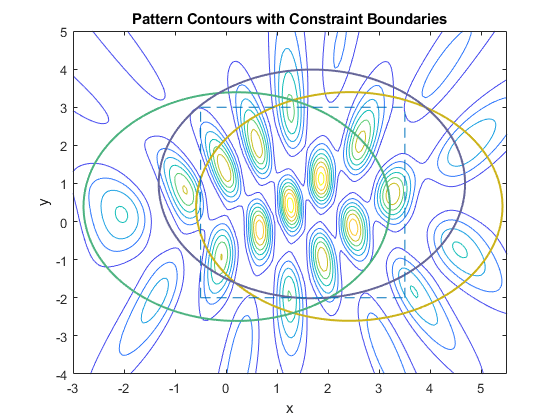 Now let's visualize the contours of our interference pattern with the nonlinear constraint boundaries superimposed. The feasible region is the interior of the intersection of the three circles (yellow, green, and blue). The bounds on the variables are indicated by the dashed-line box. Given the nonlinear constraints, we need a constrained nonlinear solver, namely, fmincon. Let's set up a problem structure describing our optimization problem. We want to maximize the intensity function, so we negate the values returned form waveIntensity. Let's choose an arbitrary start point that happens to be near the feasible region. For this small problem, we'll use fmincon's SQP algorithm. Now, let's see how we did by showing the result of fmincon in our contour plot. Notice that fmincon did not reach the global maximum, which is also annotated on the plot. Note that we'll only plot the bound that was active at the solution. Given an arbitrary initial guess, fmincon gets stuck at a nearby local maximum. Global Optimization Toolbox solvers, particularly GlobalSearch and MultiStart, give us a better chance at finding the global maximum since they will try fmincon from multiple generated initial points (or our own custom points, if we choose). Our problem has already been set up in the problem structure, so now we construct our solver objects and run them. The first output from run is the location of the best result found. All 14 local solver runs converged with a positive local solver exit flag. Elapsed time is 0.624779 seconds. All 15 local solver runs converged with a positive local solver exit flag. Elapsed time is 0.341500 seconds. Let's examine the results that both solvers have returned. An important thing to note is that the results will vary based on the random start points created for each solver. Another run through this example may give different results. The coordinates of the best results xgs and xms printed to the command line. We'll show unique results returned by GlobalSearch and MultiStart and highlight the best results from each solver, in terms of proximity to the global solution. The fifth output of each solver is a vector containing distinct minima (or maxima, in this case) found. We'll plot the (x,y) pairs of the results, solsgs and solsms, against our contour plot we used before. 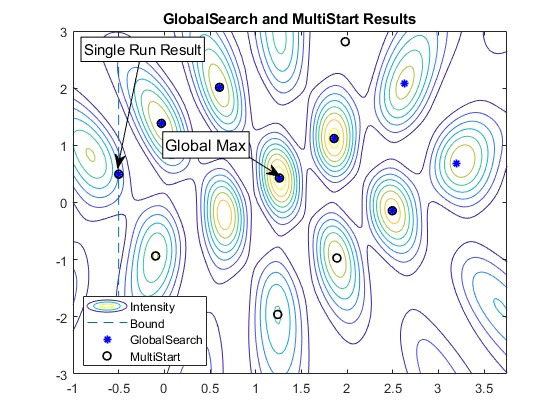 With the tight bounds on the problem, both GlobalSearch and MultiStart were able to locate the global maximum in this run. Finding tight bounds can be difficult to do in practice, when not much is known about the objective function or constraints. In general though, we may be able to guess a reasonable region in which we would like to restrict the set of start points. For illustration purposes, let's relax our bounds to define a larger area in which to generate start points and re-try the solvers. Elapsed time is 0.482697 seconds. Elapsed time is 0.432552 seconds. 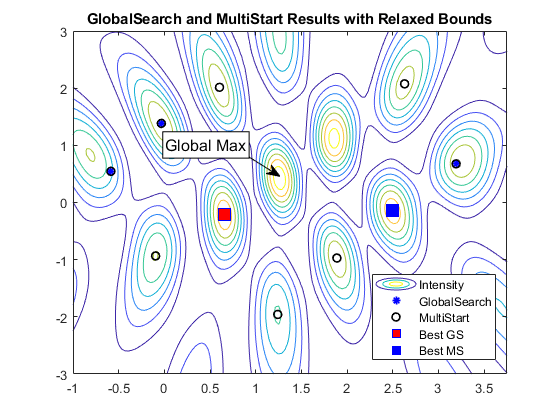 The best result from GlobalSearch is shown by the red square and the best result from MultiStart is shown by the blue square. Notice that in this run, given the larger area defined by the bounds, neither solver was able to identify the point of maximum intensity. We could try to overcome this in a couple of ways. First, we examine GlobalSearch. Notice that GlobalSearch only ran fmincon a few times. To increase the chance of finding the global maximum, we would like to run more points. To restrict the start point set to the candidates most likely to find the global maximum, we'll instruct each solver to ignore start points that do not satisfy constraints by setting the StartPointsToRun property to bounds-ineqs. Additionally, we will set the MaxWaitCycle and BasinRadiusFactor properties so that GlobalSearch will be able to identify the narrow peaks quickly. Reducing MaxWaitCycle causes GlobalSearch to decrease the basin of attraction radius by the BasinRadiusFactor more often than with the default setting. All 10 local solver runs converged with a positive local solver exit flag. Elapsed time is 0.622113 seconds. A brute force way to improve our chances of finding the global maximum is to simply try more start points. Again, this may not be practical in all situations. In our case, we've only tried a small set so far and the run time was not terribly long. So, it's reasonable to try more start points. To speed the computation we'll run MultiStart in parallel if Parallel Computing Toolbox™ is available. All 100 local solver runs converged with a positive local solver exit flag. Elapsed time is 2.641997 seconds. % WaveIntensity Intensity function for opticalInterferenceDemo. % apertureConstraint Aperture constraint function for opticalInterferenceDemo. % distanceFromSource Distance function for opticalInterferenceDemo.